Roombas are moving from their janitorial work up the career ladder. Simon Fraser University in Vancouver is planning to release a swarm of 30 mini-robots that will communicate with each other. The Engineer writes: "The $1,000 robots are 12 centimetre cubes that can see with infra-red eyes and communicate with flashing lights and sound – hence the name chatterbox. 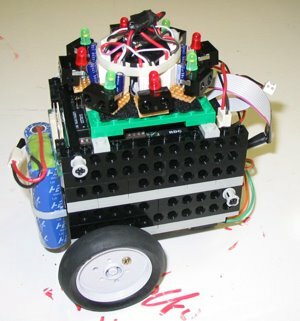 The robots are designed to work together on projects with no human intervention. One of their first jobs will be to map the building where they live. They will wander all over the place, taking measurements, but above all they will have to remember to get recharged. When they do need a sport of power, two large mother robots will deliver electricity to them." How does it relate to advertising? You could release a bunch of these guys onto a supermarket floor and instruct them to follow shoppers and nag about buying more stuff. Just like those smart remote-controlled shopping carts. When "monetizing robotic swarms" becomes the buzz word of 2010, remember you heard it here first.